Are you seeing ROI from your buyer personas? drive stronger marketing results and more sales. Publish and manage personas from a scalable, flexible cloud platform. IMPACT: A centralized persona repository leads to 5X increase in use of personas. Drive 2X sales pipeline and 3X better marketing. IMPACT: Persona-driven sales and marketing yields 2X more pipeline and 3X lift in campaign response. Never be irrelevant using these third-party insights to continuously understand their changing needs, priorities, preferences, and more. High-performing organizations are 7.4X as likely to have updated their personas in the last 6 months. 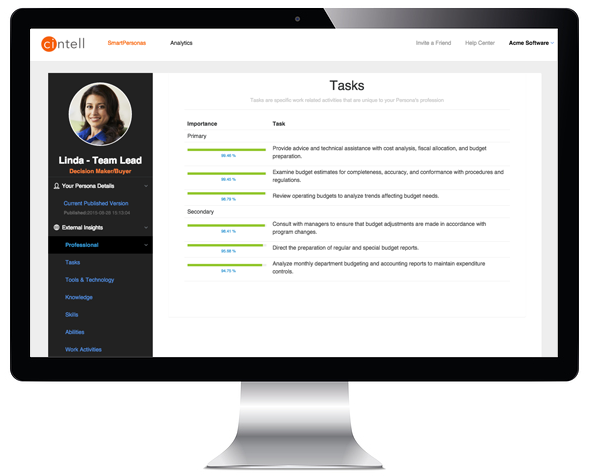 Ready to become customer-centric with Cintell? “Using buyer personas can improve content effectiveness, sales productivity, and marketing campaign performance. But for organizations to gain value from personas, they must be operationalized.